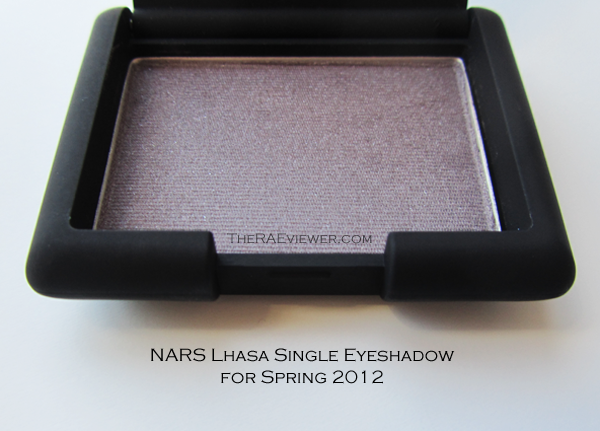 I cannot remember the last NARS seasonal collection to pique my interest, but Spring 2012 was actually quite beautiful! The limited edition single eyeshadow, Lhasa, $23, was the first to draw me in. Still, I only splurged on it because Cafe Makeup and Makeup Magpie raved about it. Was it worth it? 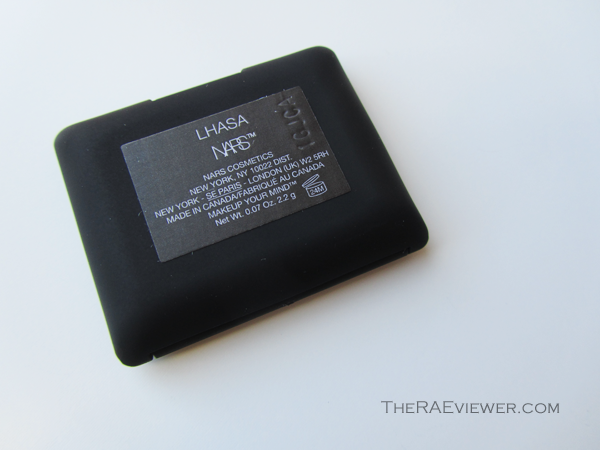 While Lhasa is not a product that will change my life, it is indeed a lovely eyeshadow with a subtle silver sheen and excellent pigmentation. It is not too powdery and applies evenly across the lid. 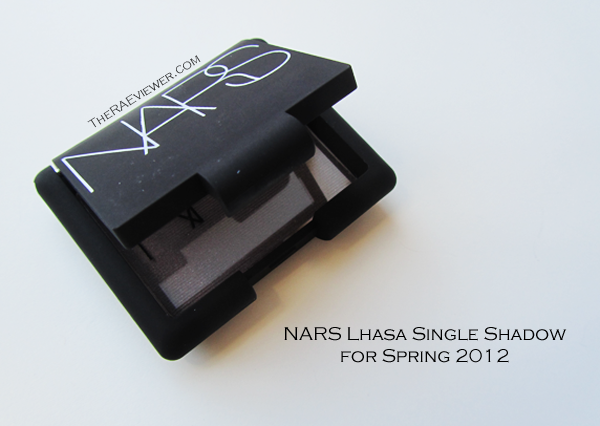 It lasts all day when paired with the NARS Pro-Prime eyeshadow base. 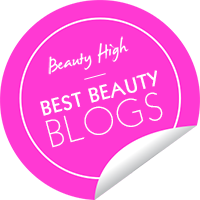 But unlike Liz of Cafe Makeup, who pulls off Lhasa alone on her lids beautifully, I personally find this eyeshadow unappealing when alone on my yellow-toned light-medium skin. It pulls too grey and cool, like a black eye that has nearly healed.. but shimmery, so I would add a matte black eyeshadow to the crease for some balance and restrict Lhasa to the lid for a simple smoky eye. Lhasa is not a true taupe. It pulls far too purple in the pan and far too grey on my lids. 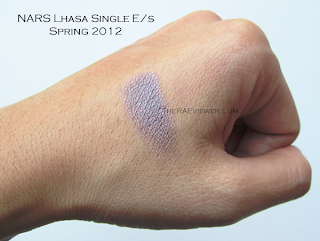 The swatch on the back of my tan hand pulls more grey (on fair skin, Lhasa seems to run more purple - see the swatch on my fair arm below) and the shimmers create a slightly frosty finish. The silver shimmers look a touch chunky and loose in the pan, but they are not apparent on the eyes and I have not experienced any fallout with this shadow. Here, I have photographed Lhasa with Chanel Taupe Gris and the taupe from Chanel's Cristal-Dusk duo. 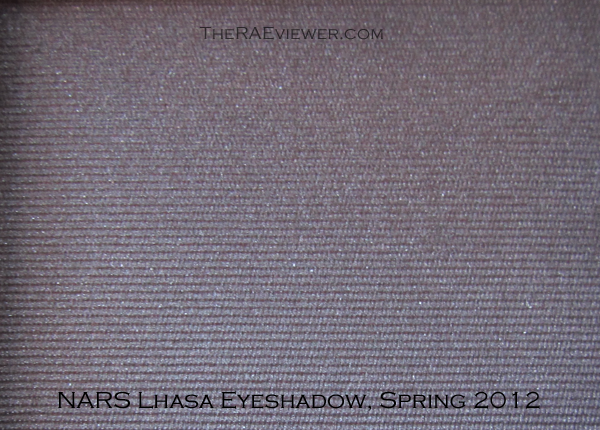 Lhasa's brown tones are much more faint and while it is more similar to Taupe Gris because they are both cool shadows, Lhasa has a more satiny texture, like the Cristal-Dusk taupe. 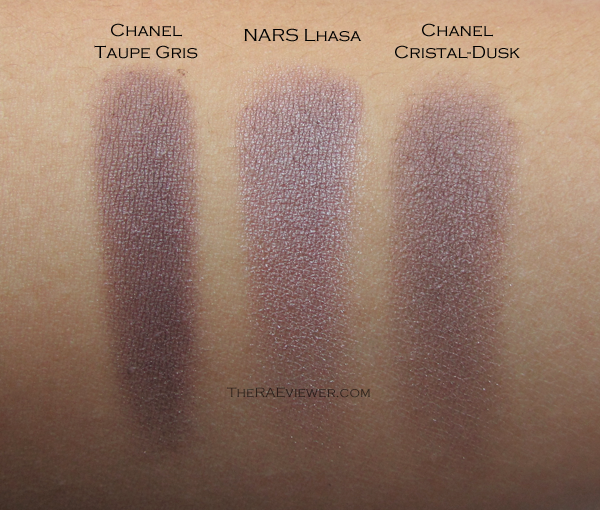 The discontinued Chanel Irreelle Duo shadows had such a soft, silky feel. It's a shame they were pulled! 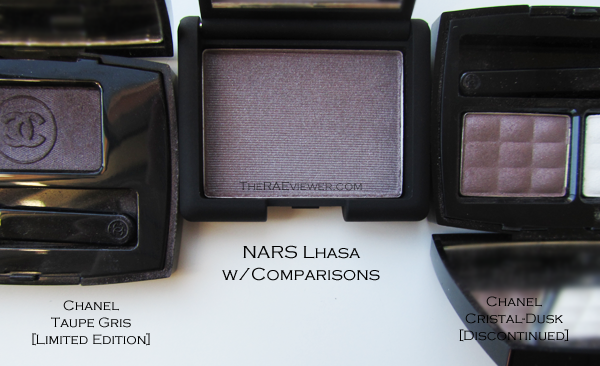 Once swatched on the fair skin of my arm, I immediately wondered how close Lhasa would be to Armani's Eyes to Kill Silk Shadow in 3. 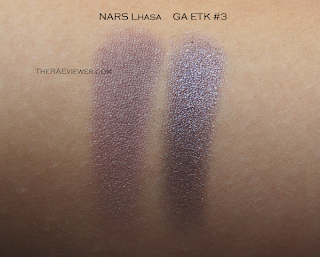 The base colors are both cool, but ETK 3 is still a richer purple, grey with no brown undertone. 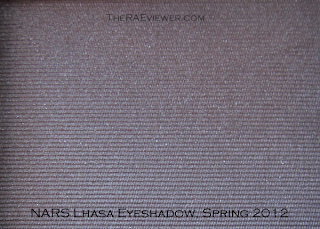 It also has a highly reflective metallic finish, whereas Lhasa has a subtle silver sheen. Bottom Line: If the color appeals to you, Lhasa is a quality eyeshadow that is unique enough to warrant a splurge. I recommend! I love gray, taupes! One of my favorite gray, taupe shadows is the BB long wear cream shadow in Galaxy. 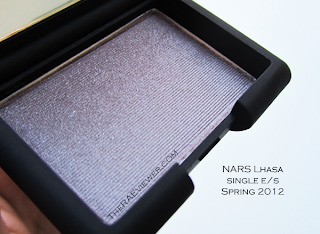 It has some sparkle in it but the color is more sheer than those that you've swatched. I layer it more for night but use a small amount for day. Looks great with hazel or green contacts. If you have tried it, I like to know what you think. I personally think it would look great on you. Eiffel - I do own Galaxy! 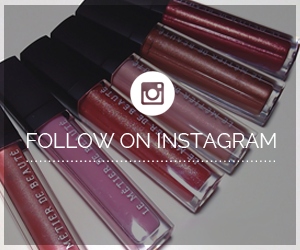 I'd love to wear the color alone but it's a little sheer for me. But when I layer it up, the glitters tend to cake. My skin of my eyelids is naturally not very smooth so the caking only attracts more attention to it :( I'm glad it works for you, though!! Great comparisons! 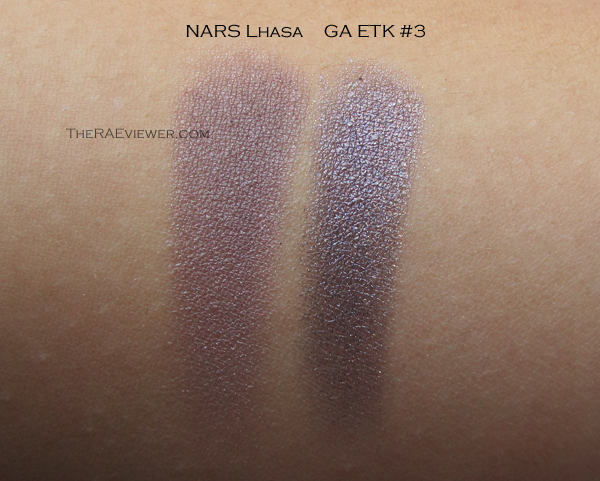 I love the look of the ETK #3 in your swatch :) Thanks so much for the mention. I actually prefer ETK #3 to Chanel Illusion d'Ombre in Illusoire.. some people might want to crucify me for saying that, though LOL And you're very welcome!